Dette nyrenoverte 2-etasjers semi-fast huset, som ligger i den gamle delen av byen, får deg til å føle seg hjemme. Du er bare et par minutters gange langt fra det berømte Diokletians palass, vakker sandstrand og mest populære barer. Leiligheten er veldig spesiell fordi den er i to etasjer, helt fornyet og velutstyrt. Kjøkken og stue (1. etasje) gir deg et spisebord, uttrekkbar sofa (for 1 ekstra person, eller kanskje 2 barn), TV, Wifi, AC, kjøleskap, vannkoker, mikrobølgeovn, kaffetrakter, komfyr, strykejern .. .
Øvre etasje inneholder et bad med dusj og et loft-stil soverom med en dobbeltseng og et takvindu. My son booked this lovely little appartment for me and my husband as a present and what a great gift it was. Thank you very much for such a great review. Frane and brother wonderful, clean, two separate sleeping areas. 7 min to Riva. Frane and his brother were most helpful and welcoming! Apartment was very clean, easy 7 min walk to Diocletians palace, and plenty of space for my mother and me with bed and sofa bed. No sulfur smell. Eat at Poseidon! Richtig gutes Appartement, klimatisierte Räume, komplette Küche mit allem was dazu gehört. Strand, Einkaufsmöglichkeiten ist alles in 10 Minuten erreichbar. Ich kann echt nur empfehlen. Father and son guests. I was traveling with my college age son. 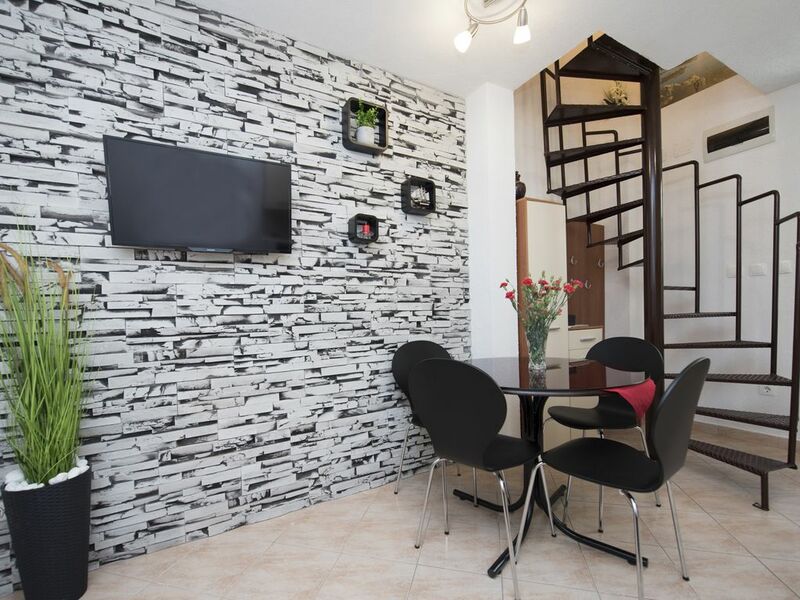 Location: VERY CLOSE to everything ... a short walk to down town, shopping, restaurants, bars, tourist destinations, bus stops, and the bus station. BUT private and quiet. Liked the private entrance space. Condition: VERY clean. WELL STOCKED with everything that we needed. We were traveling really light so it was great to find little things like coffee for the morning and tea for the evening. Host: Super friendly and accommodating. We came in on the overnight train from Zagreb. When I notified him of that he mobilized his cleaning crew to get the unit prepped and ready for us MUCH EARLIER than the original check in called for. He was SUPER RESPONSIVE to all emails and texts. Overall with 18 days in Europe and staying at 6 different places this one was clearly one of the best! I whole-heartedly recommend working with this team and staying here while you are in Split!